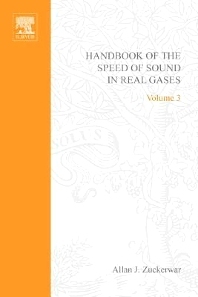 After the introductory chapters in each volume, the material in each chapter starts out with definitions and engineering formulas, applies these to the individual gases, and proceeds to advanced theory at the molecular level. The formulas and theory are illustrated with examples throughout. Uncertainty, in both measurement and prediction, is a recurring theme throughout both volumes. The engineering formulas are suited to engineering and science students at the undergraduate level. The advanced theory is for professionals and students at the graduate level. The Handbook will survey the state of the art from 1921 to the present, pointing out gaps in our present knowledge. Chemists and Chemical Engineers; Mechanical Engineers; Physicists; Acousticians; Meteorologists; Aerospace engineers; Liquefied natural gas industry. Engineering and Science Students.